What I feel is small and large at the same time. I feel small on the outside, but large on the inside. I feel the smallness of my problems. They feel petty and mewling and narcissistic and of utterly no consequence–as does my life. So I’m supposed to tell what it smelled like on the mountain and what it sounded like and what its texture was. It smelled like granite and it was the texture of a complex Indian carpet and it sounded like the inside of a crystal vase. And there was dizzy, incalculable space. 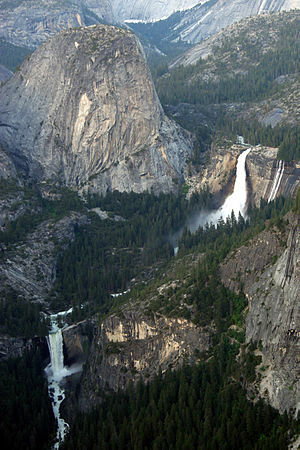 The Panorama trail in Yosemite in the Sierra Mountains has steep inclines and a narrow bridge that spans the Merced River which foams white in early summer. We passed 2 donkeys tied to a tree who had carrried chain saws and gas cans up a steep way so that trail maintenance crews could cut down dead sequoia trees. Because when I saw this place I thought of death, my individual death. Because in the face of what I was seeing, my individual death seemed of absolutely no consequence whatsoever. The only thing that was of consequence was sky and rock and tree and river, and beyond that ether and vastness and on and on and on. The puniness of my life became so evident, but it wasn’t a bad or a sad thing. It was just a fact. The puniness of most lives is a fact. Which doesn’t take me off the hook to live well and consciously and meaningfully and to be kind and courageous and sweet and helpful. Not at all. In fact, life is even more precious in the face of my puniness. My inconsequential and puny life is all the more miraculous in the face of sky and rock and tree and river. The way I look at the ant is the the same way the sky looks at me: I am a curious little thing down there. Very busy and self-important and self-involved. Working very hard at her little task. Kind of admirable too, the way she carries her dead, and makes the collective hill a little higher, and drags that huge piece of crumb so very, very far. Look at her go! She works very hard, that little one. The prompt for today was to pick one moment during which you felt most alive this year. That was it. In the face of my mortality, I knelt and said a prayer of gratitude for my little life. Thank you for taking the time to work your magic with words. I always look forward to your posts! You have a splendid way of putting things into perspective.